If you have ever visited a Boat or Sportsman’s Show you may have stumbled across a booth filled with prints of your favorite fish species on a background of a navigational chart. As far as we know, this clever presentation was developed by Alan. I have several of his works in my home and have seen them in countless other homes and marine businesses. 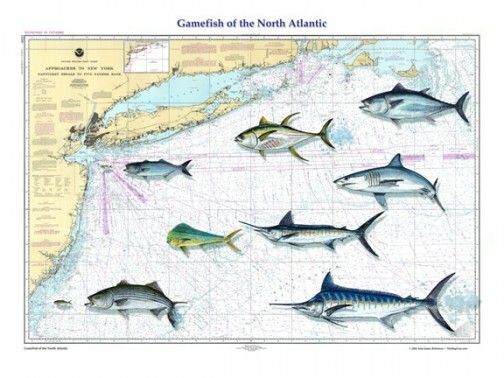 The two most popular forms of his work are the custom chart and map prints starting at $ 95.00 and the original fish, animal and lighthouse prints starting at $ 50.00. You can select from a wide variety of regional NOAA nautical charts, multiple charts can be merged together and excerpted to include your desired area, multiple sizes are available starting at $ 95.00. You can select images from Alan’s extensive Art Library including fish species, birds, animals, lighthouses, nautical symbols and letters, etc. at no extra charge. Your work directly with the Artist to design and position the images to your needs. You can also a custom image of your boat, home, marina, pets, etc. You will receive an original watercolor of the image or images as well as the custom print. For a truly unique piece of Art you can commission an original chart with original watercolors painted directly on the map. A price list is available for varying size charts and custom images. Framing is also available at an additional cost. Alan has also painted over 100 species of saltwater and freshwater fish. These images, matted 12 x 16 inches, can be purchased individually starting at $50.00 or added to a custom chart (see above). Many of his saltwater fish can be found throughout the Northeast Angling website on the recommended tackle pages for various species. Each piece is an individual numbered and signed limited edition print. Framing is available at an additional cost. These prints are great for the office, home, trophies, gifts or a special occasion.